I am working at a makeshift shelter...aka, Catholic school and church. For some reason ICE decided to release families who have someone in the US who are willing to support them. These are fathers and mothers who are escaping violence in Central America, came to the US to request asylum and we put them in jail. They have been sleeping in concert buildings with nothing more than a foil blanket and served frozen, uncooked, burritos every day. There are now 4 shelters in El Paso receiving bus loads every day. We had 68 people who arrived yesterday (the same the day before); etc. We welcomed them with hot food, clean clothes and toiletries, and love. We immediately began working on getting them transportation to be with their families…some were leaving on planes at 6:00 am today so we could get ready for the next bus load later today. In the meantime I am going to the tent city in Dennison where they are holding thousands of children that have been separated from their parents. We will make signs and protest along with a few others. 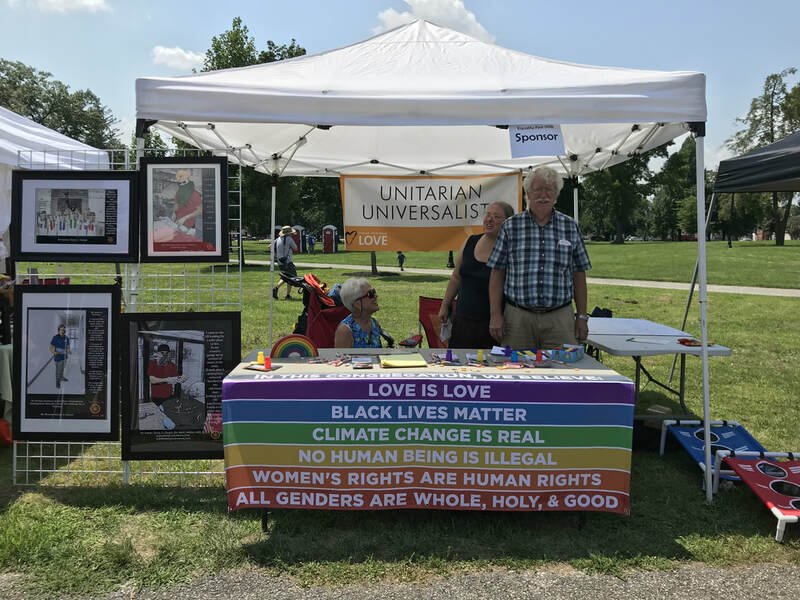 The Unitarian Universalist Congregation of York (UUCY) has made a commitment to opening its doors to people of all sexual orientations and gender identities. If you are looking for a religious community or seeking someone to officiate your ceremony of union or other special event, you are welcome here. For a draft Statement of Conscience (SOC) to appear on the 2017 General Assembly Final Agenda, our UUA bylaws require a minimum of 25% of certified congregations to participate in the ballot vote on whether the draft SOC should be placed on the Final Agenda. As in past years, this poll has reached Active Members, and these polls have either identified study issues, or, in the case of this poll- supported the study of an approved issue. "Upward mobility—the American Dream—has become a myth. Concentration of wealth and power has skyrocketed. Dr. King’s dream of justice and equality has fractured. Half of all Americans are impoverished or struggling, as the middle class shrinks and billionaires take the profits. Where’s our commitment to the Common Good?" Download the 4 page PDF statement here. Our congregational vote results will be reported with our UUA Annual Certification, and will be shared again with our Active Members. UU-UNO Executive Director Bruce Knotts conducted an hour-long informational workshop and Q and A about UU-UNO after our 10 AM service on November 13. This workshop was sponsored by our Social Justice Committee and the Racial Justice Team of UUCY. Bruce focused on working for equality and an end to violence, education for global citizenship and the collaboration with the Think Equal campaign. He also discussed climate justice. ​Bruce Knotts was a Peace Corps Volunteer in Ethiopia, worked for Raytheon in Saudi Arabia (1976-80) and on a World Bank contract in Somalia (1982-4), before he joined the Department of State as a U.S. diplomat in 1984. Bruce had diplomatic assignments in Greece, Zambia, India, Pakistan, Kenya, Sudan, Cote d’Ivoire and The Gambia, where he served as Deputy Chief of Mission. While in Cote d’Ivoire, Bruce served as the Regional Refugee Coordinator for West Africa. Bruce worked closely with several UN Special Representatives and observed UN peacekeeping operations in Sierra Leone from 2000-2003. Bruce retired from the Foreign Service in 2007 and began as Executive Director of the Unitarian Universalist United Nations Office (UU-UNO) in 2008. Bruce founded faith-based advocacy for sexual orientation/gender identity human rights at the United Nations and continues to advocate for the rights of women, indigenous peoples and for sustainable development in moral terms of faith and values. In 2006, Bruce and Isaac Humphrie were wed in Vancouver, British Columbia, Canada. Isaac works internationally as an event environmentalist, photographer and social media consultant. April 2017 UU UNO Intergenerational Conference (see photo above) - no younger than 14- UN requirement. 2014 People's Climate March- UU's were the 2nd biggest religion in attendance. 2015- 2024 International Decade of African Descent. 2014. Structural. Alicia Garza, co-founder Black Lives Matter. 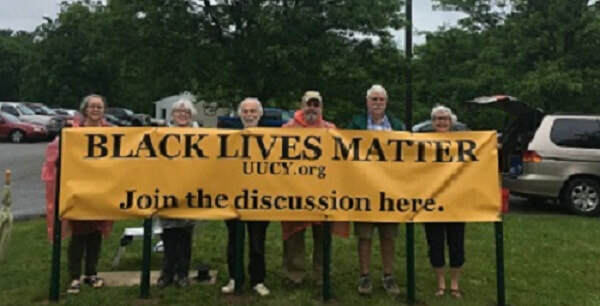 UUCY members and staff joined other UU congregants and ministers from the US and Mexico on September 15 at the York Prison, in support of the 100 walkers. We moved by the walkers' stories and by the experience. While some members may have the time to directly engage with public officials on a regular basis, most of us have busy lives – lives that make it difficult to visit our legislators or write letters concerning the issues of the day. That’s where the Unitarian Universalist Pennsylvania Legislative Advocacy Network comes in, UUPLAN. Its mission is to represent the 40 UU congregations in Pennsylvania on matters of justice. Approximately 15 years ago a member of UUCY, Jeff Lears, contacted the manager of Our Daily Bread, our local soup kitchen. Member Jo Roussey found the recipe and we started our ODB mission. ODB is UUCY's longest running Social Justice commitment. Our new UUCY Racial Justice Team, under the care of our Ministry of Spirit and Witness, welcomes you to our next meeting. 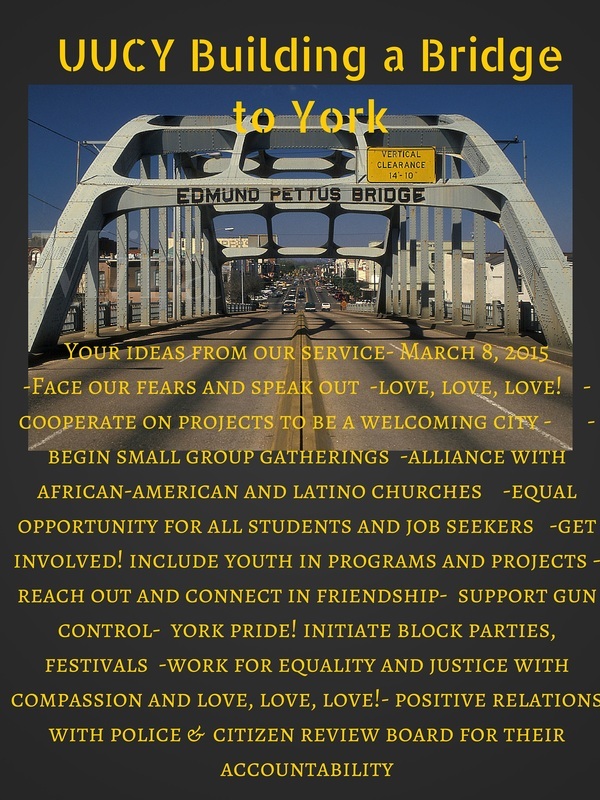 Our purpose is to work towards racial justice at the local, state, and national levels. Our first task is to educate ourselves and other interested members of the UUCY community about the issues, potential avenues for change, and community programs that we might choose to support. Racial Justice Team will sponsor monthly public programs on racial justice & related subjects. Public Events will be held on the third Tuesday of each month at 6:30 PM in the UUCY Sanctuary. Regular team meetings will be held 4th Tuesday in the Susan B Anthony room. Engaged @ UUCY is a new group sponsored by the Social Justice Committee. It seeks to be an outlet for mindful activism, grounded in ethics such as right speech, right action, non-violence with a sharp focus on Global Climate Change and species extinction. We provide education, retreats and trainings and spiritual support (Eco-dharma) that is relevant to all spiritual backgrounds to encourage those who wish to bring their spirituality into action. Engaged @UUCY's main focus is to create an eco-conscious raising event at the UUCY in September 2017. This event will invite participation by environmental groups known for long-laboring in environmental protections, will be heavily weighted to children's activities, and will begin with a multi-denominational prayer and meditation service. We meet monthly on scheduled Sundays at 3PM in the SunRoom of the Carriage House. We welcome all of our UUCY community to engage in Engaged @ UUCY. The meeting is held right before our Water in the Wave Sangha- consider staying to enjoy! Contact Jim Ebaugh with questions. A very successful program began in the spring of 2014, when Marilyn Neuberger, an ESL teacher from the Literacy Council of York, proposed having a class for advanced adult students at UUCY. The Literacy Council could not provide a space for this class and UUCY readily agreed to offer a classroom for the students---the newly refurbished classroom on the first floor of the Carriage House. Now, UUCY offers a “Conversation Club” in the parlorevery Thursday morning (except hoidays) from 9:30 to 11:30 am. During this more informal time English-speaking volunteers from UUCY meet with the students to help them practice their English and for everyone to get to know each other. The students come from many countries: Iran, Iraq, Egypt, Mexico, Turkey, Japan, China, Ecuador and Brazil. Come and sit in on one of our sessions, which run as scheduled on Thursday mornings, September- May. ​ You will want to participate too! Working towards immigration justice has been a major initiative of the UUA and UUPLAN for several years. Now we have an opportunity to reach out to those people in our own community as volunteers in the prison’s ESL (English as a Second Language) program. York County prison is a major holding center for detainees with over 400 detainees awaiting trial and possible deportation. Our focus is working with detainees who have arrived from countries from all countries and students have included detainees so far are from China, Ethiopia, Somalia, and of course our Spanish speaking neighbors in the south. We work in teams of two at a time with selected detainees; teaching materials and guidance is provided by the director of the prison Education Program. NO ESL experience is required! If you are interested in learning more, please contact socialjustice@uucy.org. UUCY's Social Justice Team | Join Us!